How to use AP Discovery? - DrayTek Corp.
How to use AP Discovery? 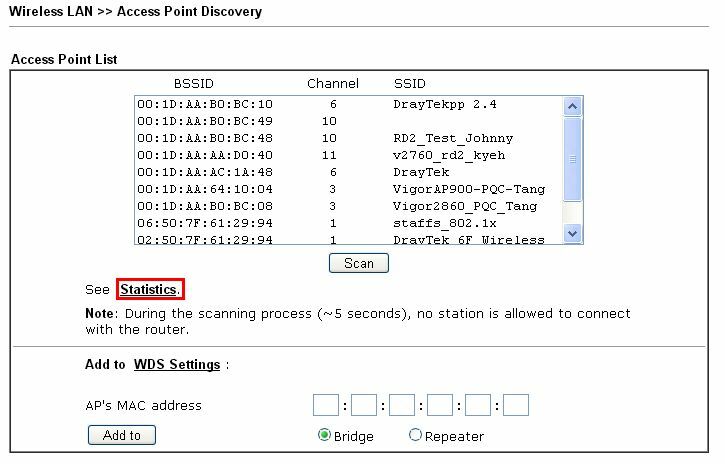 AP Discovery is a feature that allows network administrator to check the access points nearby and the channels they are using, it helps to find the best channel to use to avoid Wi-Fi interference. 1. Go Wireless LAN >> AP Discovery. 2. Click Scan and wait for about 5 seconds, the found APs will be listed. 3. Click Statistics to check the channels that are being used. 7How to use AP Discovery? has been viewed------ 7 ------times.